Locals in a remote village of Kendrapara district today observed Gandhi Jayanti by paying tribute to Mahatma and Raghunath Nayak! In simple function, residents of Jaguleipada village congregated at the village school and paid floral tributes to Bapu and Nayak. For people in Jaguleipada village, it’s a day to remember somebody who was once face to face with an event that had changed the course of modern history in the sub-continent. They paid tribute to the ‘son of the soil’- Raghunath Nayak, who grappled with Gandhiji’s assassin on the 30th January 1948. Every year on Gandhi Jayanti on 2 October and martyrs day on 30th January, we remember and pay tributes to Bapu along with Raghunath Nayak, said secretary Bapu- Raghu Smruti (memorial) Committee, Subhransu Sutar. Nayak, who worked as a gardener in the Birla house had wrestled and pinned down Nathuram Godse after the latter had fired lethal shots. 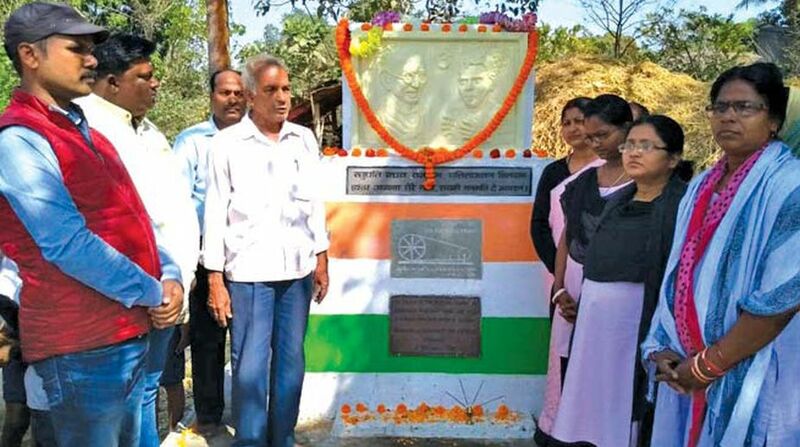 The German automobile giants, Daimner and Chaisler, had installed the busts of Gandhiji and Raghunath in the village school in recognition of Raghunath’s heroic deeds. Ragu’s act of heroism even finds mention in “Mahatma Gandhi-The Last Phase”, a biography of Mahatma Gandhi written by his private secretary Mr. Pyarelal, he said. “The portraits of Bapu and Nayak find a pride of place in the premises of Jaya Malavya Nodal Primary School. Gandhi Jayanti was observed today in the school premises. The school children flanked by guardians, parents and locals today paid floral tributes to Mahatma and Raghunath”, Headmaster of the Jay Malavya Nodal school, Jagulaeipada, Kailash Chandra Sahu. “Enthusiastic children thronged to the school campus and recited the Ramdhun. Children as well as teachers and locals garlanded the portrait of both Mahatma and Raghunath Nayak”, he said. Raghunath Nayak had remained unnoticed in his lifetime. He also went unsung after his death on 13 August 1983. We the local residents however pay our tributes to Nayak, which he richly deserved, he felt.